As more homes get multiple computers, more homes need some type of network storage. With network storage, you can share music files, videos, and photos among machines; send files back and forth; and implement a backup strategy. A USB drive connected to an AirPort Extreme Base Station or a Time Capsule wireless drive can handle the backups—assuming all the machines in your house are Macs. But if you want a central repository for your family’s iTunes library, or a place where everyone can share files without pillaging one another’s hard drives, or if your home network has both Macs and Windows machines, those two Apple solutions aren’t enough. Network-attached storage, or NAS for short, could be what you need. It can handle a wider range of storage chores than either an AirPort-connected USB drive or a Time Capsule can. NAS has been commonplace on large enterprise networks for years. But this technology can also have a place in the home (or small business), providing always-on storage for Macs and non-Macs alike. NAS is inexpensive and surprisingly easy to set up and use. Compared with the cost of buying every Mac in the house its own external drive, NAS can be cost-effective, too. NAS involves more than just attaching a hard drive to a network: NAS devices are really mini file servers. Running an embedded operating system (usually some form of Linux), they give you full control over users and permissions. Most offer additional services as well: some support FTP, virtually all work with both Windows machines and Macs, and many can function as iTunes and media servers, too. Many major storage and networking vendors sell some form of NAS (sometimes called network hard drives). For the purposes of this column, I chose Synology’s Disk Station DS107+ and bought a 500GB hard disk to go with it—which provided enough room to back up four Macs and serve up a moderately sized iTunes library. The Synology is compatible with both Mac and Windows, can use external USB or eSATA disks, automatically backs up to an external disk, can work as an iTunes server, and is accessible via FTP. Whichever NAS device you choose, you connect it via Ethernet (most, but not all, are equipped with Gigabit Ethernet). Few, if any, NAS drives are wireless. You can connect the device directly to your router, to a switch or hub, or even to the Ethernet port of the latest AirPort Express. You can then stash it out of sight. Many NAS devices come with their own preformatted hard disks. Others are empty shells into which you install your own disks. The Synology is one of the latter. If you’re using one of the empty shells, you can fill it with any internal drive; a 500GB hard disk costs less than $100. Hardware installation is easy—all you need is a screwdriver. Software setup is simple, too. Like many NAS devices, the Synology uses a Web-based interface for configuration. A half-dozen wizards walk you through the processes of adding users, sharing folders, and more. Ideally, you should set up an account for each person who will access the server, then set up individual folders for each, adjusting permissions as necessary. 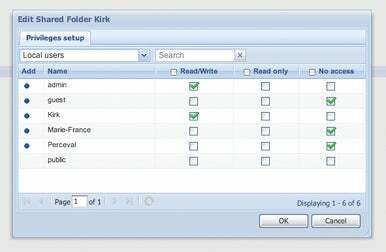 You’ll also want to create a public folder for sharing files. Setting up permissions for shared folders is as easy as checking a few boxes. 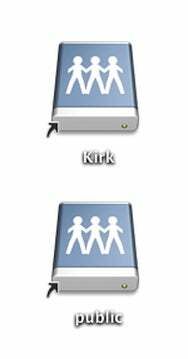 Once you’ve set up the drive, it should appear in the Finder’s list of shared devices (at least under Leopard). If it doesn’t, you can mount the shared folders by typing the IP address of the server (Go: Connect To Server will take you to the correct dialog box), then selecting a folder. If you set a fixed IP address for the NAS device in its network settings, you can make aliases of your folders after you mount them for the first time, and stash them somewhere—the desktop, say—for easy access. With aliases to the server’s folders on your desktop, you can access the folders more quickly. Copying to and from an NAS device is not lightning fast; generally, these devices work well with large files, but copying lots of small files can be a drag. In most cases, you won’t be copying a lot of files at once (except, perhaps, for your first backup) , so this won’t be a problem. Also, as with any server, the more users access the device, the slower the access speeds become. Although the Synology DS107+ can handle 32 concurrent connections, more than a handful of people copying a lot of files simultaneously can slow things down. If you have a big family or a midsize office, you’re better off with a more powerful NAS unit or a stand-alone server computer that handles file serving. In addition to sharing files via the Finder, you can also connect to some NAS devices via FTP. This allows you to connect to the NAS when you’re not at home. If you set up port forwarding in your router (FTP generally uses port 21, but you can change this in the NAS device’s configuration; see your router’s help for information on port forwarding), you can connect to the device securely from any location using FTP over SSL. One of the most practical uses for NAS is for backups. Although you can’t use this type of device for Time Machine backups (which require disks formatted in HFS+), you can still run backups of the home folders on all your Macs. You can use almost any backup software with an NAS device, as long as it supports network volumes.